Gnocchi is one of my (Celine) favorite foods. A restaurant nearby sells amazing gnocchi with shrimp, almonds, marinara, and basil. The gnocchi are tender and delicious, the sauce and shrimp are flavorful, and it is just a spectacular meal! Generally, gnocchi is made with potato and uses a ricer, which we don’t own (although Smitten Kitchen has a recipe that does not use one- someday we’ll be trying it!). It’s known for being a challenging dish to make and get the right texture. 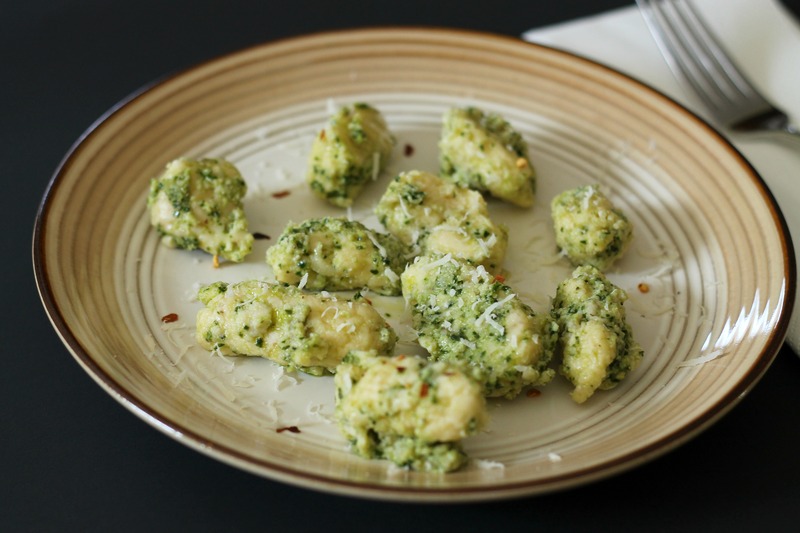 These are instead made with ricotta, so they technically are a dish called “gnudi,” but that’s just weird to say, so gnocchi it is. Well, these turned out wonderfully! The gnocchi themselves are tender from the ricotta cheese and flavorful thanks to a nice amount of Parmesan in the dough. They are topped with kale pesto, which maybe sounds weird if you haven’t had kale before. The pesto has a similar flavor profile to basil pesto, and since basil isn’t in season, this is a substitute that is equally delicious. We think it would go nicely on pizza, sandwiches, or pasta. The finished product is tossed with a little olive oil, red pepper flakes, nutmeg, and freshly grated Parmesan cheese, making this a meal we would be happy to receive at a restaurant! Grate Parmesan cheese and set aside. Wash the kale, and tear the leaves into bite-sized pieces. In a food processor, combine garlic, kale, and walnuts. Pulse until the ingredients are chopped finely, but are not mushy. Add grated Parmesan cheese, kosher salt, lemon juice, and balsamic vinegar to the food processor, then turn it on and add olive oil in a steady stream. Pour into a bowl and refrigerate until serving. In a large bowl, whisk egg and egg yolk. Add ricotta, ½ teaspoon pepper, ½ cup Parmesan cheese, and ½ teaspoon kosher salt and mix until well combined. Add ½ cup flour; stir just until combined and mixture forms a ball; add more flour as necessary if the dough is too wet. Dust a rimmed baking sheet generously with flour. Use 2 large soup spoons to shape heaping tablespoonfuls of dough into football shapes, and then place them on the baking sheet. Roll the gnocchi with more flour so that they are coated. You should have around 30. Cook gnocchi in a large pot of boiling salted water, stirring occasionally, until cooked through and tender, 5-6 minutes (the dumpling will quickly float to surface, but continue cooking for the entire time until they are fully cooked). Gently remove to dumplings with a slotted spoon and place carefully in a colander (this will prevent them from breaking up- some of ours broke when we attempted to pour all the gnocchi into a colander at once!). Pour the water out of the pot and gently return the gnocchi to it. Add the kale pesto, a few drizzles olive oil, a bit of grated nutmeg, a few pinches of red pepper flakes, and a bit of kosher salt. Gently toss to coat. Taste, and adjust seasonings as desired. Top with Parmesan cheese and serve hot. Enjoy!